"Beef and mushrooms simmer in a rich ale sauce before going into a hearty, flavorful pie guaranteed to warm you up on cold winter evenings." Place the beef stew meat, onion, and ale in a large saucepan. Simmer over low heat until the meat is tender, about 30 minutes. Season the beef with garlic, thyme, parsley, Worcestershire sauce, salt and pepper. Mix in the potatoes and mushrooms. Cover and simmer over medium heat until potatoes are just tender enough to pierce with a fork, 10 to 15 minutes. Whisk a small amount of the sauce together with the flour in a small bowl, and stir into the beef. Simmer until slightly thickened. Fit one pie crust into the bottom and up the sides of a 9 inch pie plate. 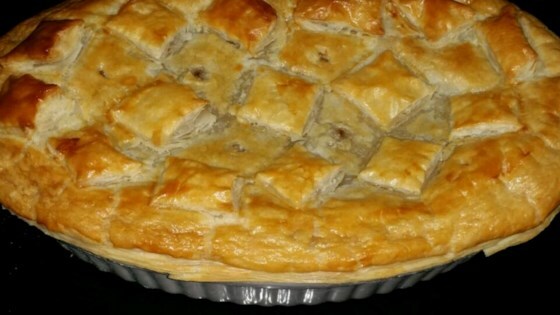 Spoon the hot beef mixture into the crust and top with the remaining pie crust. Cut slits in the top crust to vent steam and crimp the edges to seal them together. Bake in preheated oven until the crust is golden brown and gravy is bubbling, 35 to 40 minutes. Good. Added carrots and beans. Also used 2 bottles pale ale (and a bit of water) because not enough liquid. Used thyme, basil and oregano.